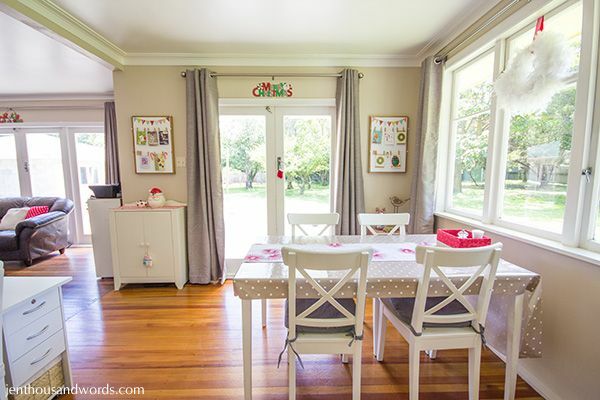 The last couple of spaces that I decorated for Christmas are the dining room and kitchen. 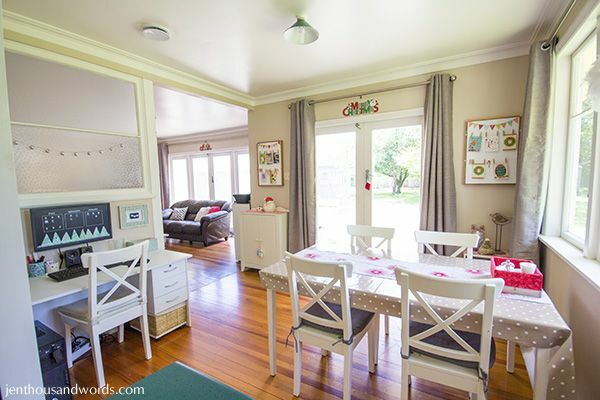 I'll start with the dining room, which also contains my little office area. The cabinets beside the French doors got little runners that I made from an inexpensive tea towel. 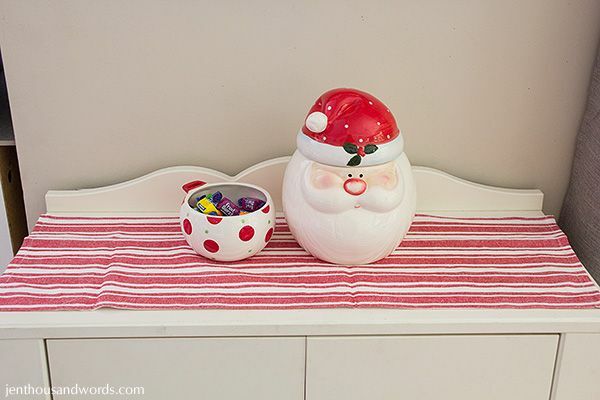 I bought the Santa cookie jar years ago at a Christmas store in England; the dotty bowl was thrifted recently. 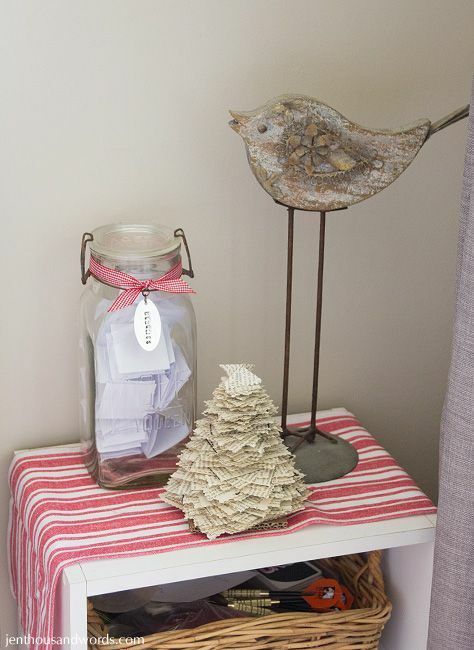 I added a red gingham ribbon to our memories jar; the paper tree was made for me by my friend Carley. 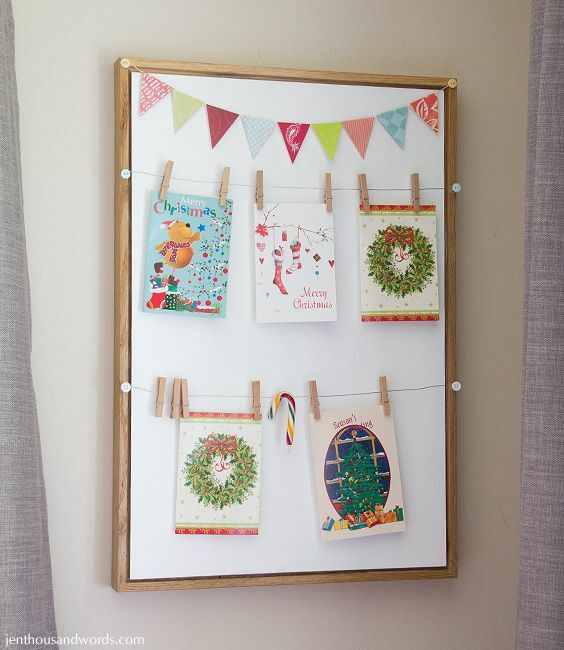 Above the cabinets hang these card hangers. 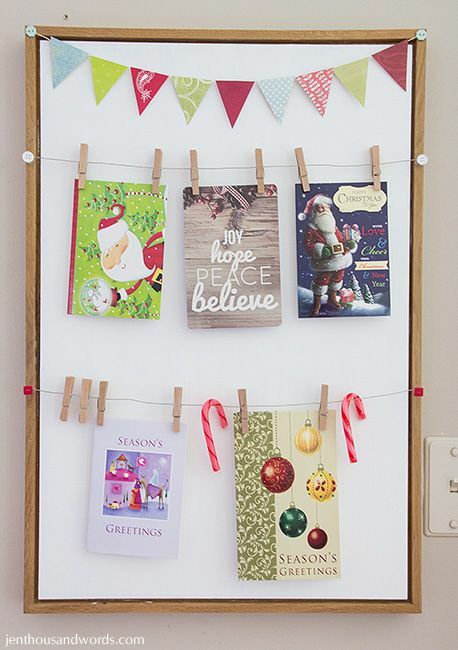 I adapted the photo hangers that I had in our laundry room in our last house, painting the background white and switching the bunting to Christmas colours. 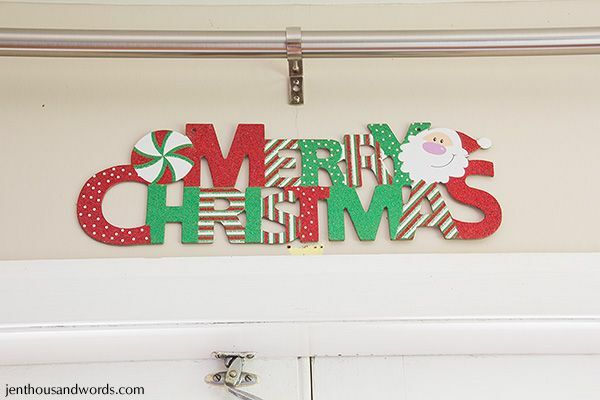 I got this little sign from the dollar store. Above the table I've hung a wreath that I made years ago with a wicker wreath form and a couple of feather boas. 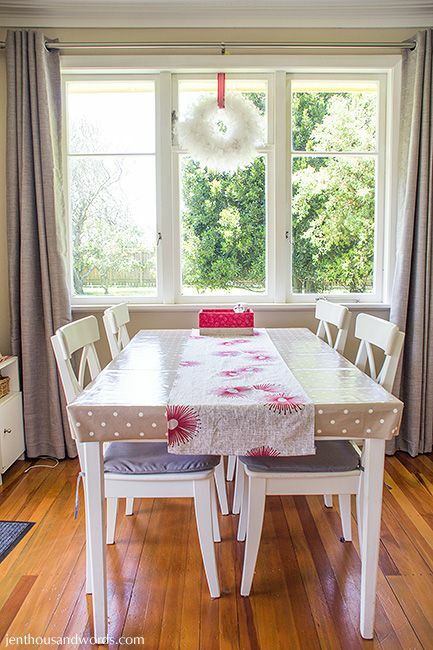 I also made a runner with the pohutakawa fabric. 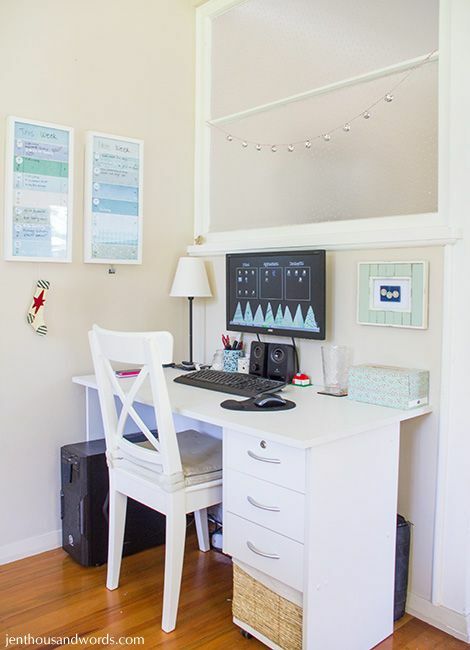 I only added a couple of Christmas touches to my office area. 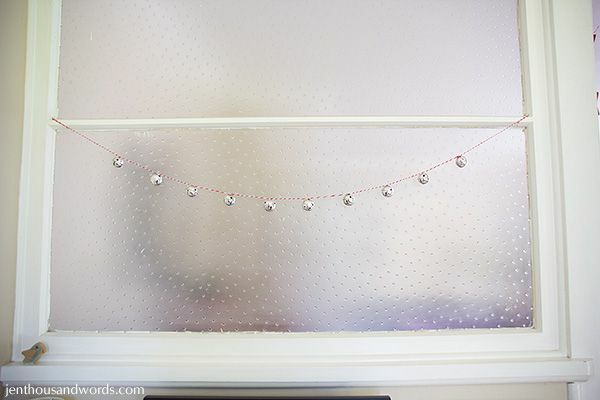 I made this bell garland from dollar store bell ornaments and baker's twine (also from the dollar store). 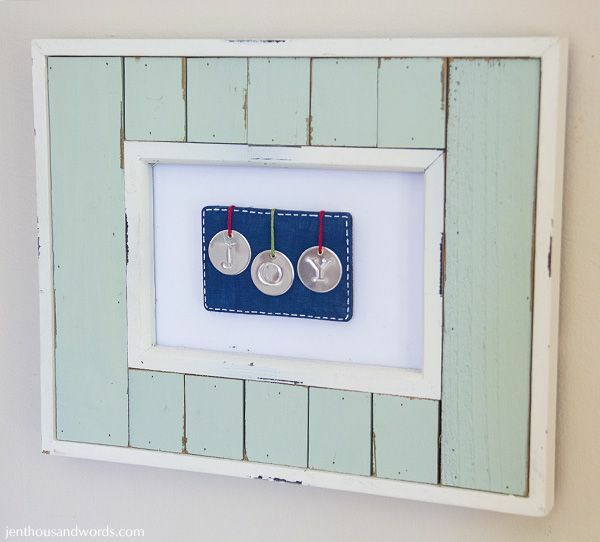 I made this little Joy sign years ago. I've stuck it to my little noteboard with poster putty. I can do without the note board for a few weeks. 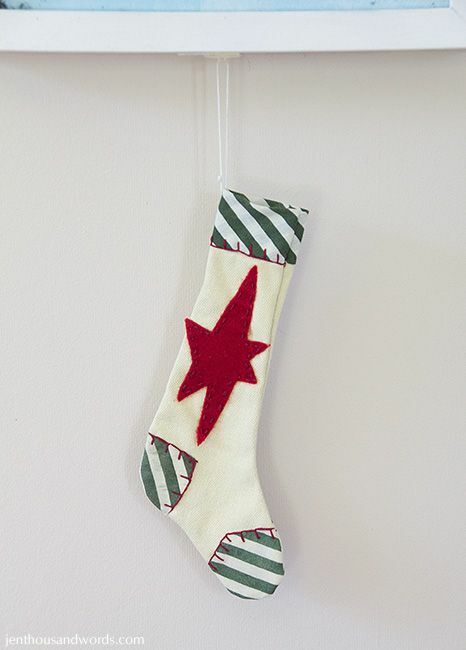 A little stocking hung from one of the wall calendars completes the Christmas look. 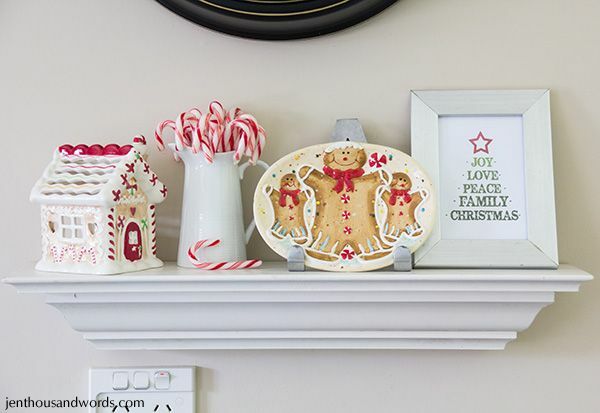 My favourite festive touch in the kitchen is the Christmas shelf. 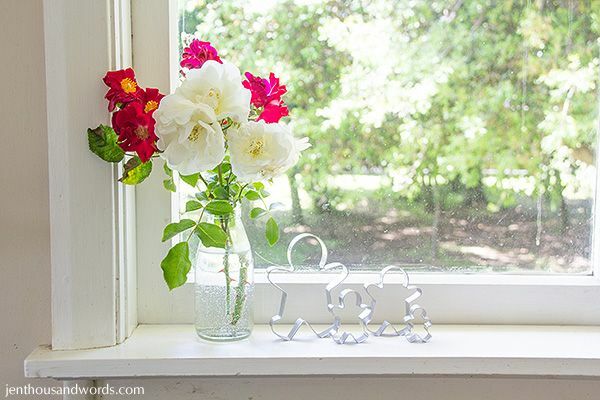 I have added a few more little items, like this gingerbread cutter family and red and white roses from the garden. 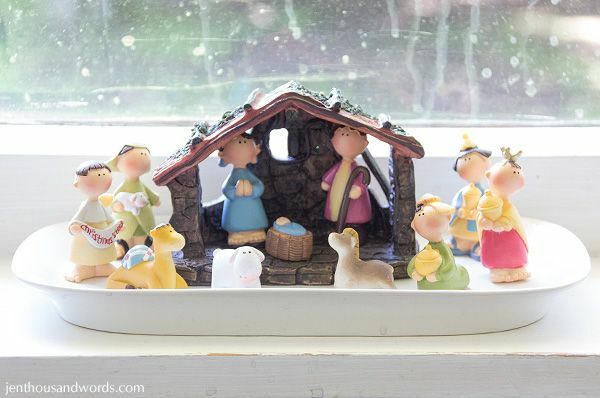 The centre of the windowsill is the perfect spot for this little nativity. 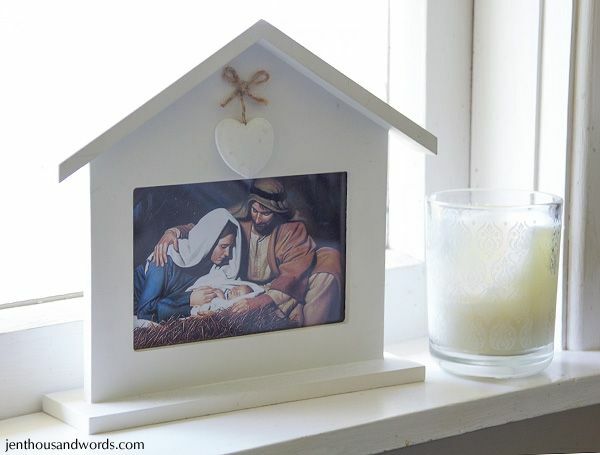 The other end of the windowsill holds a candle and my favourite house frame with a nativity picture in it. 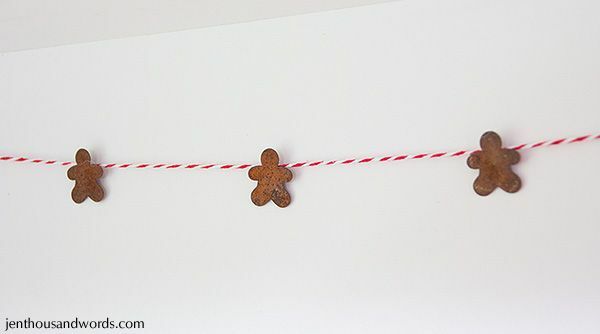 I made a little gingerbread man garland for the back of one of our open shelves. 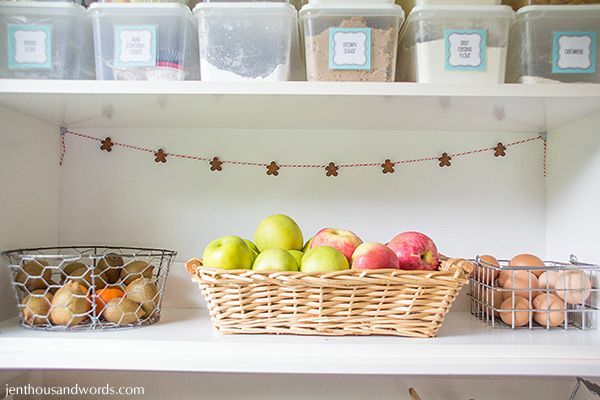 I've had these little rusty tin shapes for years and years, and simply hot glued them to baker's twine. 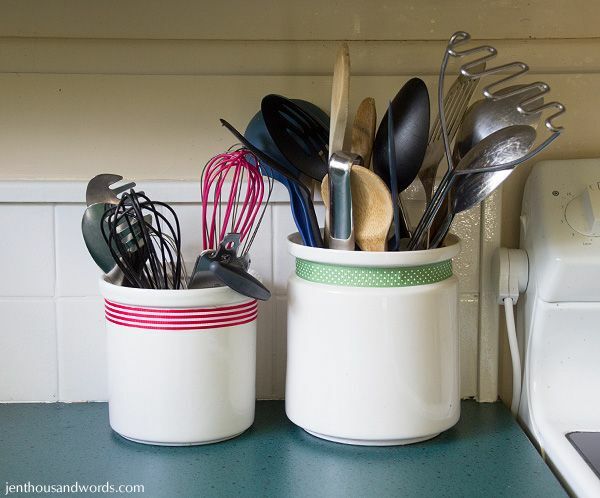 A couple of pieces of ribbon add some festive cheer to the utensils canisters. 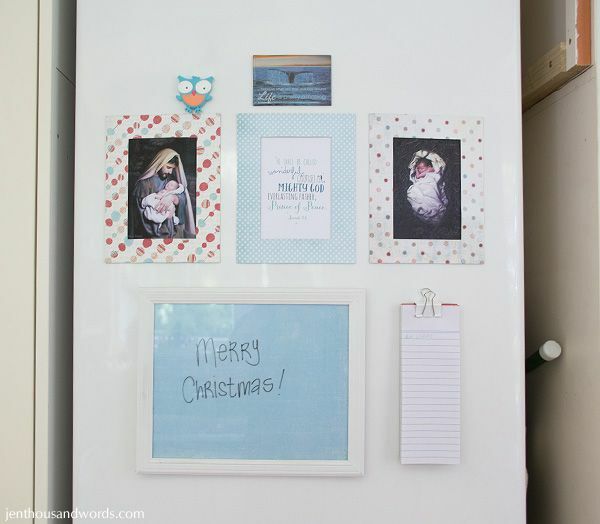 I like to keep the fridge simple. 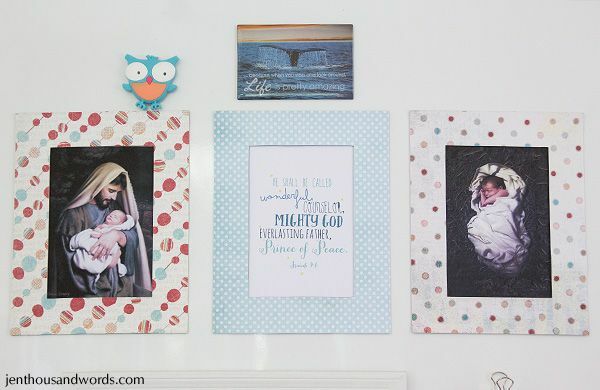 I switched out the usual photos for a couple of pictures of baby Jesus (one with Joseph), and a scripture. 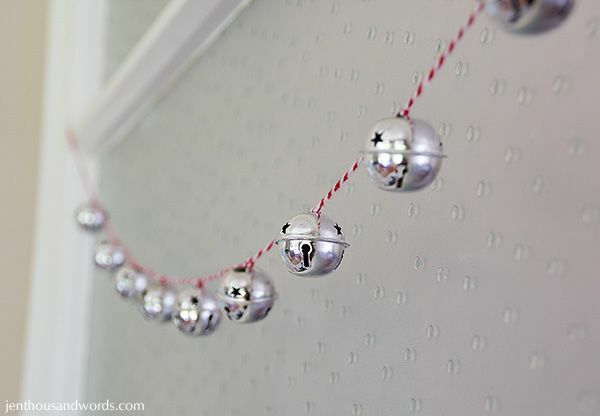 And that's it for the Christmas decorating! If you'd like to see a video tour of the spaces, here it is (if the video doesn't appear, please click here to see it).